Home Applications Business Starbucks Card Mobile - 3 Million People Payments via Phone App! Starbucks Card Mobile - 3 Million People Payments via Phone App! Grasping a cup of your beloved Starbucks coffee has become much easier this year. 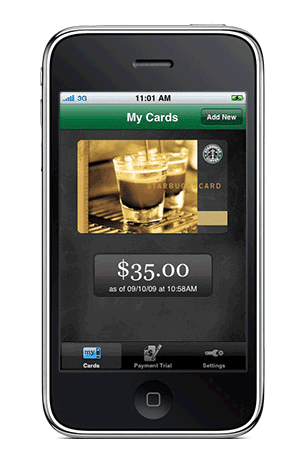 Starbucks decided to accept mobile payments via Starbucks Card Mobile > app for iPhone and Blackberry – in 6,800 stores the company operates. Coffee giant declared couple of days ago that more than 3 million people have already paid using Starbucks Card Mobile! Despite this, it serves loyalty system and customer identification as well. The milestone was presented by Howard Schultz, chairman and CEO, during the annual meeting of shareholders, held at Marion Oliver McCaw Hall in Seattle. “Starbucks now offers the nation’s largest mobile payment network,” said Brady Brewer, vice president of Starbucks. Starbucks Card Mobile is a “touch to pay” system, allowing customers to hold up the barcode of the app to the scanner at the register while paying for coffee, using the electronic tender. 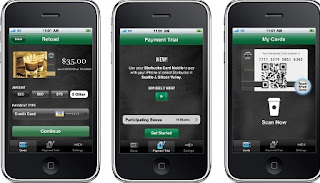 The program was tested at several stores in September 2009, and extensive piloting demonstrated Starbucks Card Mobile to be the fastest way for paying. The last financial decade appeared to be the most beneficial and best performing in 40-year history of Starbucks, according to Howard Schultz. Mobile Cards accounted 22% of the whole transactions. Starbucks brand is number one on Facebook with 29 million fans, and is also a top brand on Twitter and Foursquare. Do you think this success is due to Starbucks marketing strategy or has smartphone growing industry contributed to company success?